Sydney’s leading trainer Chris Waller has his champion mare Winx spot on for her farewell appearance in the 2019 Group 1 $4m Longines Queen Elizabeth Stakes (2000m) on Day Two of The Championships at Randwick today. Winx, above, is spot on for her final race in the 2019 Queen Elizabeth Stakes at Randwick. Photo by Ultimate Racing Photos. Winx will be stepping out for the final time under race conditions today and a third win the Queen Elizabeth Stakes will take her winning streak to thirty-three as well as collecting her twenty-fifth Group 1 win. “She is spot on,” Waller told Sky Racing’s HQ Saturday. Waller said that he has prepared Winx and himself no differently than he would leading up to a major race and added that Winx is ready to fire for her grand final appearance. “When she gets to her grand final she knows what it is all about and she is ready to fire,” Waller said. The champion mare then claimed her fourth win in the Group 1 $1m George Ryder Stakes (1500m) at Rosehill on March 23 as her final lead up run into today’s Queen Elizabeth Stakes. Waller has put Winx’s imminent retirement to the back of his mind and has been concentrating on preparing his stable super star for her grand final appearance in the Queen Elizabeth Stakes. “I haven’t given any thought towards her retirement other than the fact that today is her last race because there is so much at stake today,” Waller said. The Randwick track has been rated a Soft 5 for Day Tow of The Championships with no rainfall in the last 24 hours and the rail in out 3m for the entire course. Winx will jump from the outside barrier in the nine horse Queen Elizabeth Stakes field with regular jockey Hugh Bowman in the saddle. 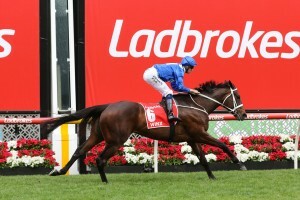 Winx continued to firm in the Queen Elizabeth Stakes betting at Ladbrokes.com.au and is now the $1.06 favourite on race morning while her nearest rival in the market at $18 is the Sir Mark Todd trained English visitor He’s Eminent. The post Waller has Winx spot on for her farewell in the 2019 Queen Elizabeth Stakes appeared first on HorseRacing.com.au.